I want to let you know I have not answered your blogs because I may have had a mild stroke. I had an MRI today which should tell. Hard to type, right side is numb. I can read though. Hope to be back soon. These are the roads I like to walk. They are located on large tracts of land. The landowner chooses to not allow vehicles, which is fine with me. It's along these roads that some of the best times fishing are not on the water. 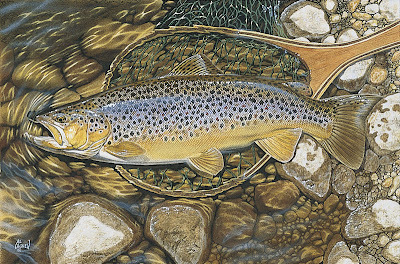 The brown trout has been in this country since the late 1880's. 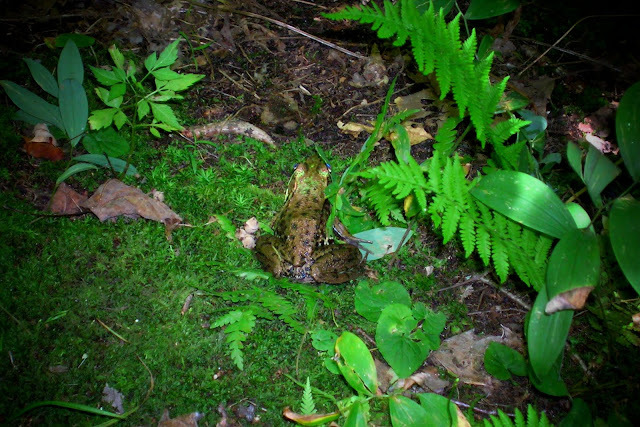 And although not a native to The U.S. they have been here long enough to be naturalized. 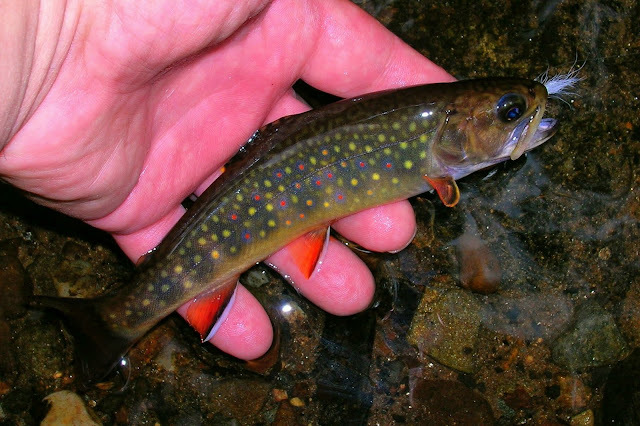 Those that follow this blog know of my love for the wild brook trout, and the small streams where he dwells. The brown trout is a close second, for he is a formidable quarry found in small as well as large waters. 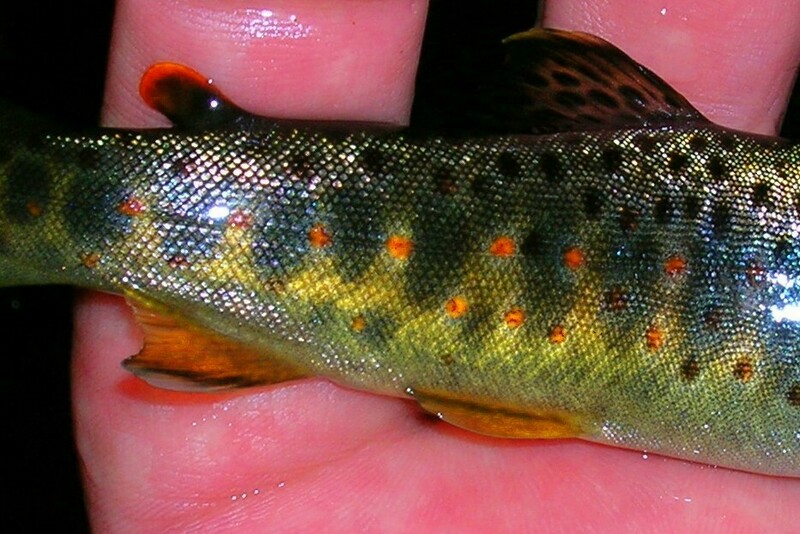 My preference in the angling of the brown is in the same small streams as the brookie. In some instances they manage to coexist in the same streams. 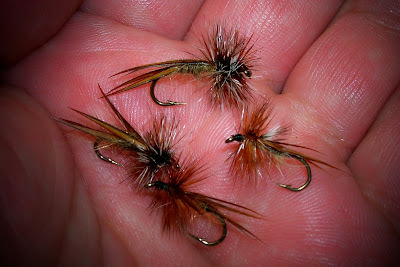 The brown will take a variety of flies, but my type of flies for this trout are dry, and streamers. 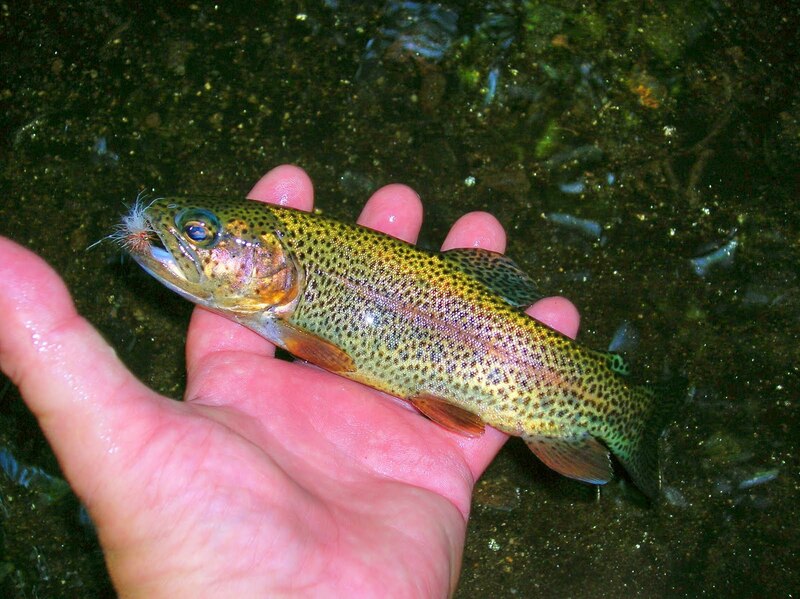 This handsome trout is a meat eater, and soon discovers that little fish can fill up the belly faster than insects. 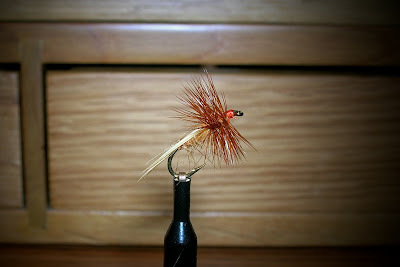 Most of my larger browns have been taken on streamers, and the Wooly Bugger is at the top of the list. 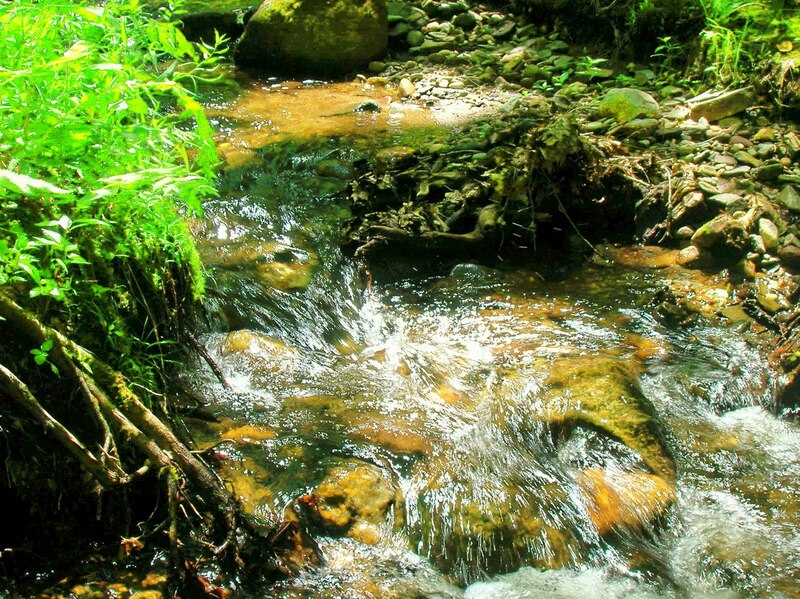 Small streams where the brown trout is found wild and scrappy. A small stream wild brown. His colors are brilliant. While most of my fishing is done a small waters, I do fish for the brown on larger rivers. This one was taken on the Salmon River in N.Y. in December on a Wooly Bugger. I believe I have done a post on this fly. If so you would not mind a refresher, I hope. 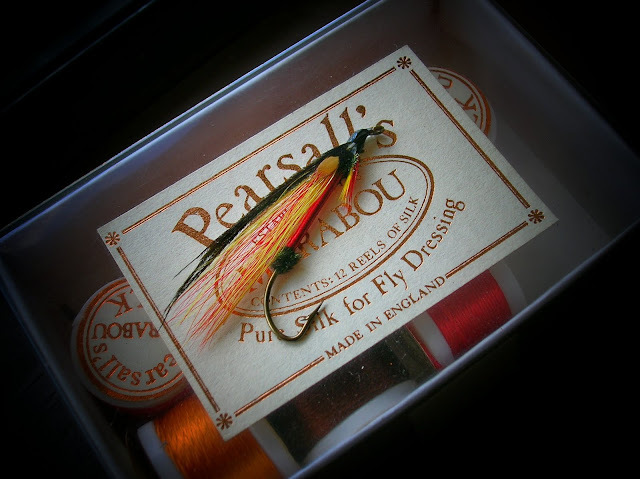 The reason I have come back to this fly is because at this time of year, late August to well into December this fly reeks havoc on wild trout in small streams. The actual origin of this fly is not certain, but one thing that is known it was created in the Southern Appalachians. 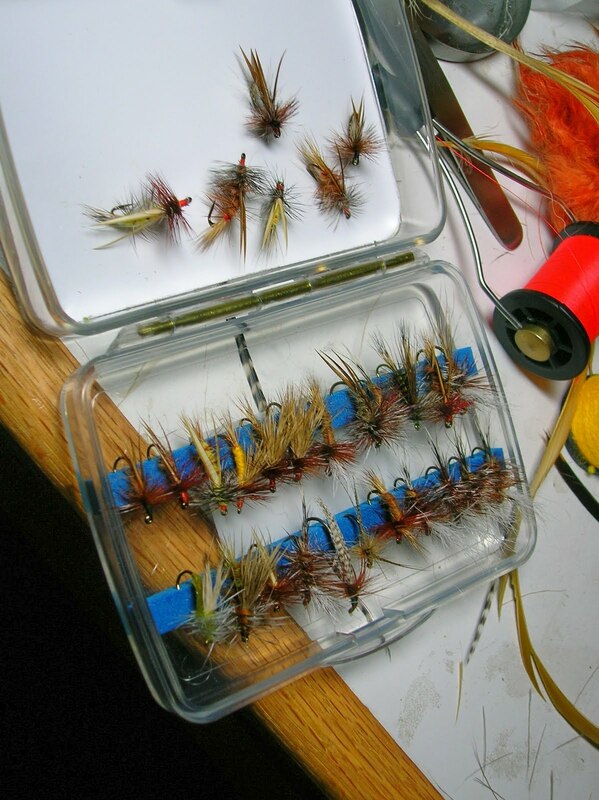 I tie this fly in several variations and they all work well to bring trout to hand. 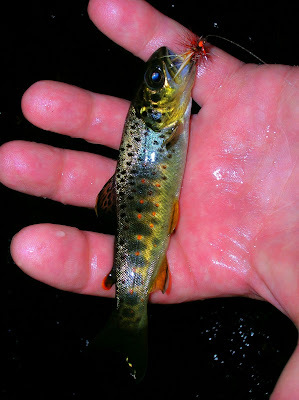 They are good floaters, and are visible to the angler, as well as the trout. 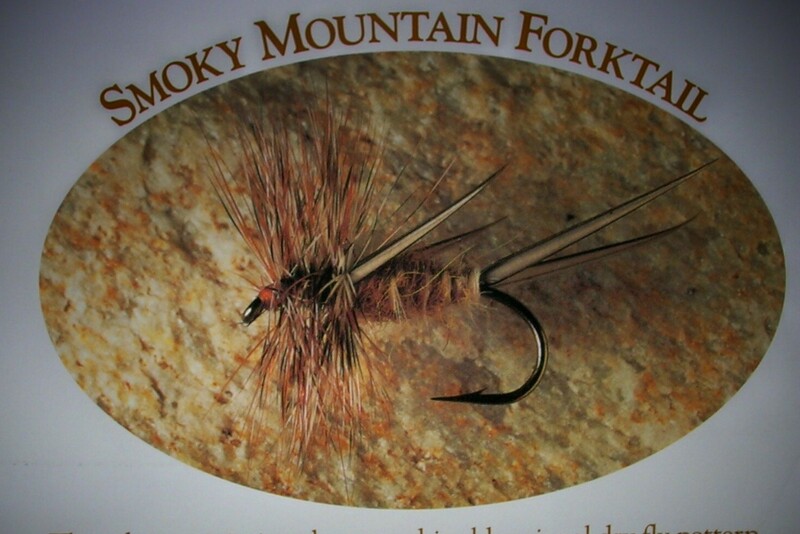 Below are two variants of The Smoky Mountain Fork Tail. Here are two views of one of the variants. Dubbing, This can be of your choice, I use Aussie Possum. 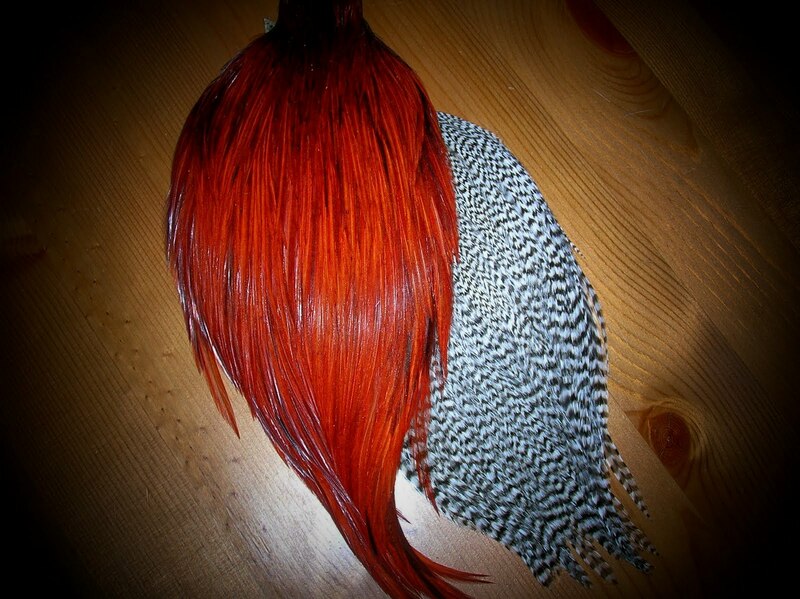 Hackle, Brown, Grizzly. I vary the hackle. 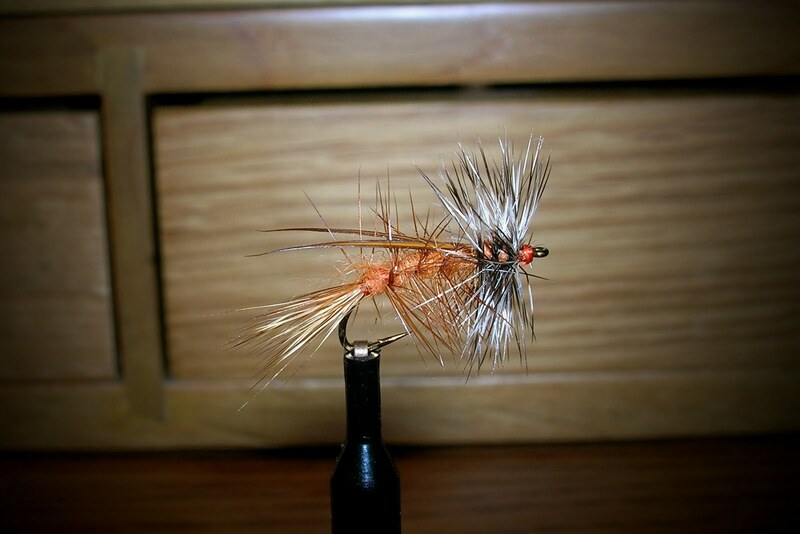 This variant is tied similar to a Stimulator. 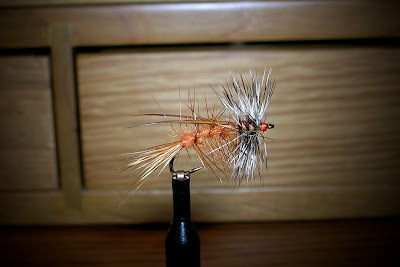 On this one I use Elk Hair for the tail. These flies are not overly difficult to tie. I keep these in my box and will go for them first when I get to the stream. I have all ready put them in to action this August with good results. I'll post that later. 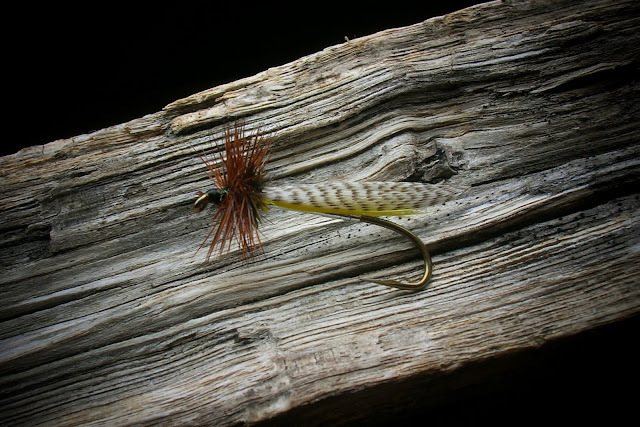 So take an hour or so and tie up a few and create a buzz on the stream. One of the things I find myself doing whenever I'm out, weather fishing or driving, I like to take photos of signs. Some of the signs tell of places, people, and achievements. Some of them are well thought out, and some.... well they're there. I suppose if I had to pay for the film, and the development I might not do this, but digital photos, much cheaper. I guess most would say there are nicer subjects to photograph, and I agree, I still like to show the signs. Last Thursday I picked up my two grandchildren at their home. We returned to my home and started preparation for a day of work, learning, and enjoyment for both grand kids, and grandparents. 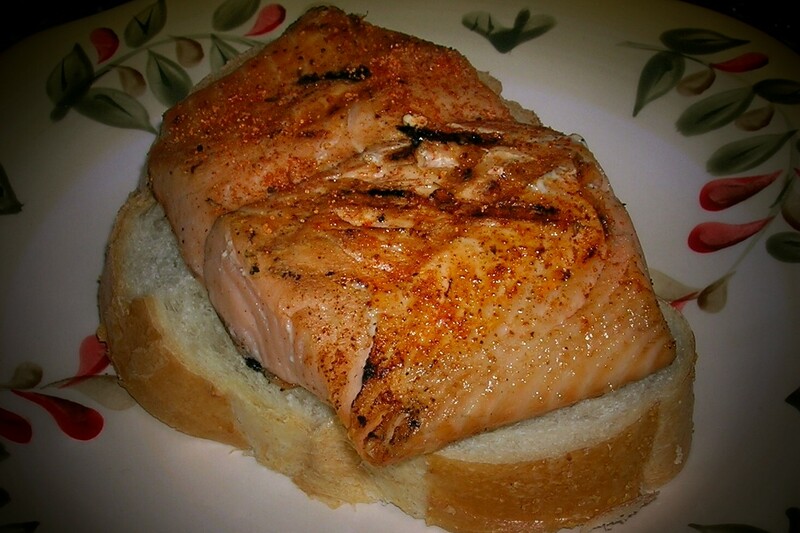 At home Morgan began to put together a lunch of PBand J sandwiches, along with some other snacks as well as water. Ethan and I got together the other things necessary for the outing. We were going to visit a small stream and do some enhancements, along with removing some natural debris. I was also going to show the two grand kids some of the wonders of a natural environment. One of their first projects. They were to help place stones into the stream to help channel water to a deeper undercut pool. 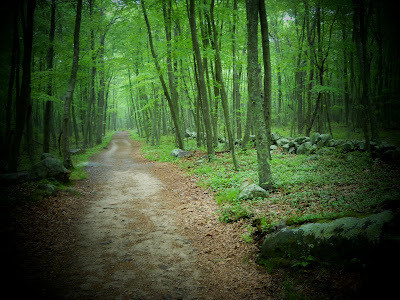 They assembled the stones, wood twigs, and some vegetation, which were collected in the woods along the stream. While the work was going on I explained to them the importance of what we were doing, and how much this would benefit the resident trout population. The completion of their water deflector. An A+ was given. I told Morgan and Ethan the importance of a cold clean environment needed to sustain a wild trout population. I gave them a stream thermometer and told them how to take a water temp. They just about checked all of that streams waters during the outing. While checking the streams temps. Morgan found this.... a small streamer, apparently lost from one of my previous outings. We stopped work and sat along the stream and enjoyed the shore lunch that Morgan had fixed. The kids asked lots of questions about the goings on of the day. I answered them to my best. Children are like sponges, they will absorb what they're told, and what they're doing. After lunch Ethan picked up the fly rod, and attempted to fool a brookie in one of the promising looking runs. Morgan and Jeanette were looking for any special item they could find along the stream. Ethan soon found out that wild trout in small clear streams, were not as easy to catch as the crappies he catches in the marina. He did not get frustrated, but instead asked why. I told him of the approach needed to help in his task. Then showing him how to present the fly. He took the rod and applied the teachings. He soon had a fish rise to the fly, but missed. The excitement of that rising trout was all that was needed. I may have him hooked. We moved to another run, and I took the rod. Several drifts of the fly produced nothing. As we were talking of moving to as Ethan put it, a better spot, the fly was sucked under, and a beautiful brook trout was at hand. 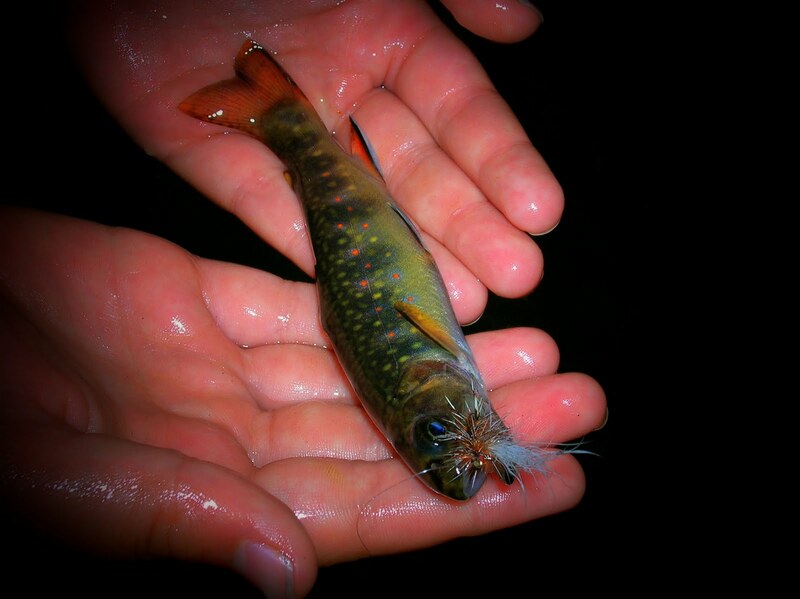 Morgan came from her side of the stream, and as I lifted the trout, Ethan held it in caring hands. A quick photo and off he went. Their first view of pure wild beauty. At the end of the day as we were walking out. 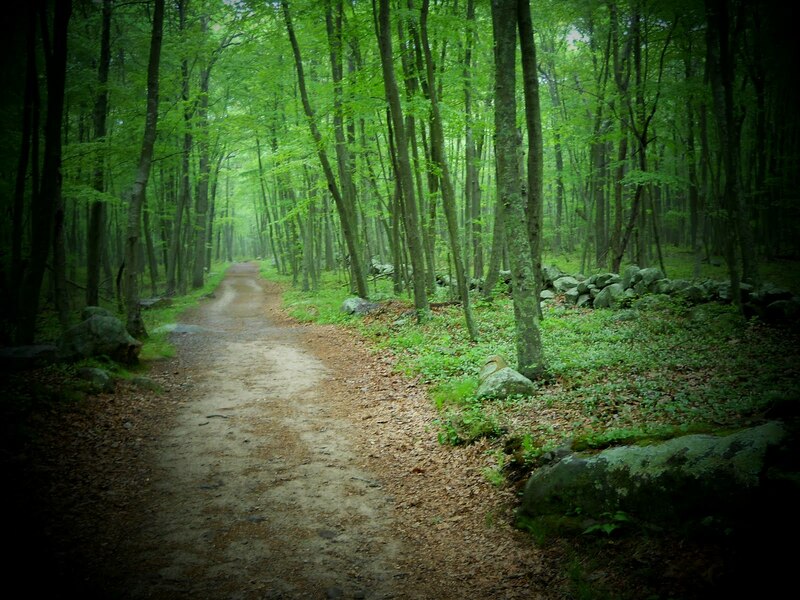 I asked how did you like your day in the woods..... together they said, Loved It. I said Thanks guys. This is a Small Stream Reflection. It's one I'll never forget. 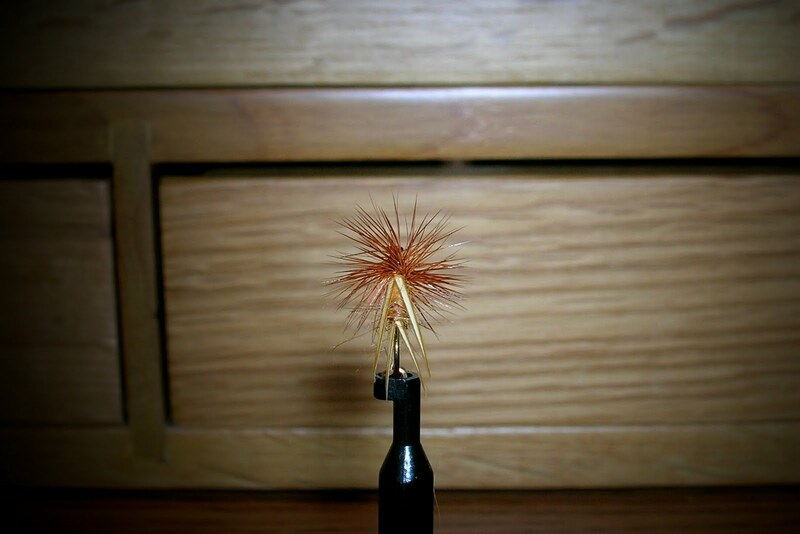 Hackle, Book, and "Royal Mic"
Those that tie flies know that in the last few months they have become a premium item. In some places, especially internet shops they have all been impossible to purchase. The reason for this is they are being used in hair fashion. Lets hope this trend dies rapidly, or your next fly purchase may be as costly as a cup of specialty coffee. This is a book that I would place very high on a list of, "just plain good books". There are several writers who tell of their experiences with wild trout. It's a very enjoyable read. This bucktail streamer...."Royal Mic", is a creation of mine. It incorporates several of the same materials used in the Royal Coachman, and Mickey Finn streamers. While most who fly fish, catching is the goal of why we are there. But there is so much more to this outdoor pursuit, especially in small stream fishing. 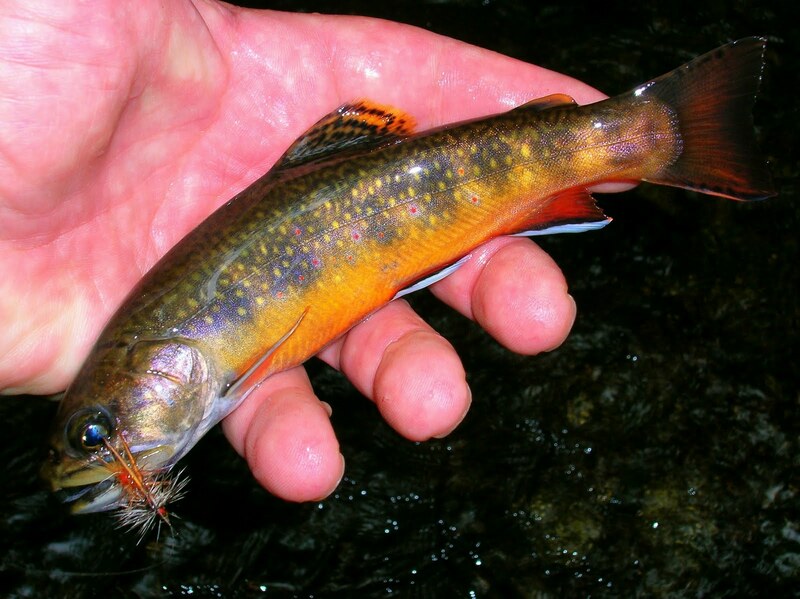 For the most part small streams do not afford the fly angler with those large trout that we see in magazines, and on the internet, although those that seek the small stream trout know all to well that a five inch wild trout is a wonderful trophy. 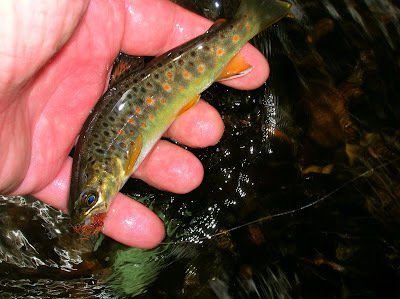 There is so much more to the small stream angler than just fishing. 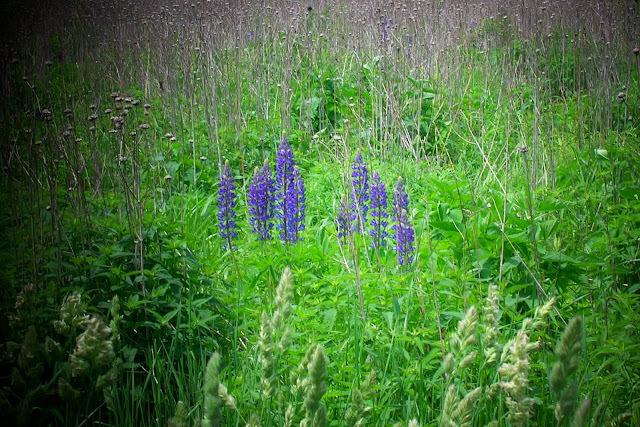 Along the way he is provided with the natural beauty that nature provides. I so many times will just sit along a stream, or the path leading in and just take in the sounds and sights near me. Each season has its own beauty, and while I prefer seasons without cold and snow, I can find something special in all of them. I'm sure all of you can too..... along the way. Paths and dirt roads provide thoughts of what has taken place here, so many years ago. So much color, and at times the smells of the forest can intoxicate. The sound of water as it flows over the stones of a stream, although the stream is small its sound can be so relaxing. If you tried to grow flowers like this at home...... would they look as beautiful? A fallen tree, across a stream provides a bridge to those woodland creatures who do not wish to get wet. I have at times seen chipmonks dart back and forth across such places. Watching this little fellow along the stream made me wonder what his eyes have seen. So the next time your out fishing a small stream, put down your rod and take a few moments to enjoy the beauty along the way. Debris, in this case I'm speaking of the woody kind. These are areas of a stream where from natural causes in the streams make up create these collections of logs, branches, twigs and over time leaves. These debris areas can be small and sometimes quite large. They afford very good protection for wild trout, as well as an insect attraction point. When fishing these woody debris places on small streams I try to allow my fly to drift as close to the main part of the pile. Usually there is a good flow there and good visibility to hiding trout. The fly can be taken in front of, alongside of or just past these natural ambush areas. A word of caution, keep a close eye on your fly, these areas can capture your flies, and losses can be high, but your ability to get more hits will improve if you fish these areas. The photos here show several different woody debris areas on a small stream. Each one requires a little thought as to where the angler should position himself to present the fly. I fished this stream yesterday and a trout was taken from each area. A place to find hungry trout. These woody debris areas can change. During high and swift water flows, and ice jams during the winter. This past spring I had to learn the stream all over because of the nasty winter changing things around. The next time you fish a small stream and spot one of these debris areas, drift a fly along it..... you may be surprised. There are times when things happen they seem to be not very important at the time they take place, but in time they become very beautiful and bring a bit of joy to us daily. This is one such time. Our grand daughter gave us a package of seed during this past winter. They were called butterfly flowers. She said could you plant these when the snow is gone, I think they will be nice and bring you lots of butterflies. I said OK and put them on the counter. Well the packet wound up in a drawer and remained there until the end of May or so. While going through the drawer my wife found the seeds and said lets plant Morgans flowers. Well I found a flower pot I thought would be big enough and planted them. They grew into some of the most beautiful tiny flowers we have ever seen. They sit on a table on the deck, and their beauty is enjoyed daily. Native produce. Blueberries, and corn, along with butter and maple syrup from this year. These are small things by themselves, but put them together and they can bring you joy for sure. Upon looking at this fly the name Hornberg comes to mind, and that's perhaps what was on my mind when I started to tie it. Although when completed it looked more like a stone fly. I have fished this fly in many streams and while it will take a fish or two from time to time it's not what you would call a killer, except on one river here in Connecticut. I won't mention the name, but it's one of our better trout streams. On this river it never fails to produce many trout. Why this is I can't guess. This is a fillet of fish sandwich........ Grilled salmon fillet, on Italian bread.